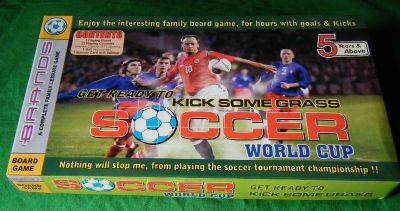 A recent American board game offering you the chance to 'Get ready to kick some grass' Oh dear. Colourful generic design for a football game. "Nothing will stop me, from playing the soccer tournament championship!!" Nice pitch with ads. 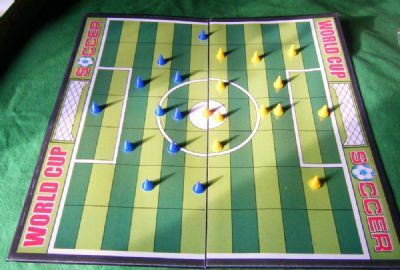 Players are small cones. The pitch does seem oddly square in shape. The only game in the world where the ball is an orange cone! Never played this game but it does hold a certain intrigue. 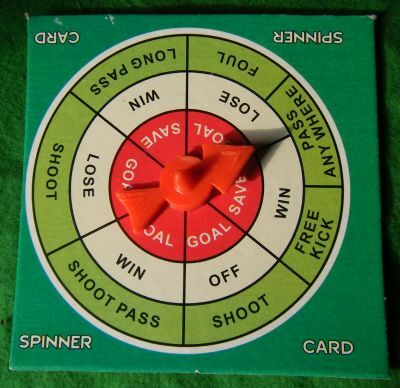 Might have to dust it off and have a game. 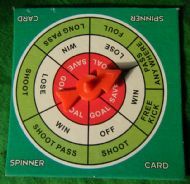 Neat little spinner to determine moves in the game. Absolutely no idea what a 'shoot pass' is.